Read profile of the Rev. Michael Funkhouser, a part-time local pastor and West Virginia’s 2013 Teacher of the Year. In New Vienna, Ohio, the Rev. Sarah Chapman’s day job is doing social media for Charmin and Puffs, two Procter & Gamble products. For the last five years, she also has been part-time local pastor of New Vienna United Methodist Church. 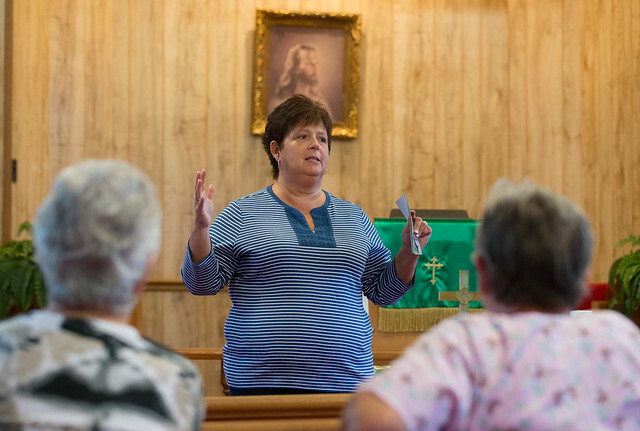 She’s sure her business skills have helped her as she leads the 150-member rural church. Most lead pastors continue to be full-time ordained elders who have earned a master of divinity degree at a United Methodist-approved seminary and passed through a provisional member elder phase. They are guaranteed a minimum salary, as well as health insurance, housing, utilities and retirement benefits. In that same period, the number of part-time local pastors grew from 4,261 to 5,178. Supply pastors — who typically serve small churches on a fill-in basis and include lay speakers and clergy from other denominations — grew from 1,163 to 1,849. The Rev. Bill Masciangelo (right) prepares for a baptism at New Moyock United Methodist Church in Moyock, N.C. As a part-time local pastor, he’s led the church to growth and financial stability. Photo courtesy New Moyock United Methodist Church. Currently, local pastors are licensed, not ordained. But some church leaders favor ordaining them as "local elders," a term that has precedent within Methodism. The church had been down in attendance and teetering financially, to the point that it considered selling its building. But under the Rev. Bill Masciangelo — who became a local pastor after careers in the U.S. Marines and the hospitality industry — regular attendance has doubled to about 110 and finances have stabilized. But Lawrence believes Course of Study doesn’t come close to substituting for a master of divinity degree, and notes that many supply pastors don’t get much training at all. The Rev. Debbie Williams is an X-ray technician and a licensed local pastor in The United Methodist Church. Weems, of the Lewis Center, notes that baby-boomer elders are continuing to retire at high rates and many more will retire soon, given that 55 percent of active elders are 55 years or older, the highest in denominational history. That, combined with more churches struggling to afford an elder, he thinks will boost part-time pastor numbers further.